Red clover is native to parts of Europe, West Asia and North-West Africa. 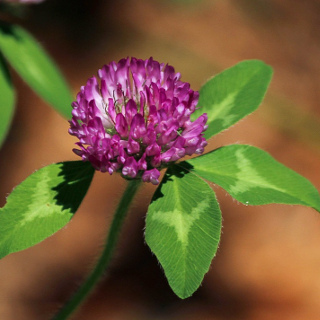 Red clover is a nitrogen-fixing, short-lived perennial that is primarily used as a green manure cover crop. Red clover has a deep taproot that is able to accumulate moisture and minerals from deep in the soil, making it drought resistant once established and helping to break up heavy soils when the plant dies and the roots rot away. The roots of red clover and other leguminous plants have nodules which host rhizobia bacteria that are able to fix nitrogen from the air and provide it to the leaves. Once fully grown red clover can be mowed and the clippings left directly on beds where they'll provide nutrient-rich source of organic matter that will feed the soil and its micro-organisms. Red clover clippings can also be added to compost piles to provide a nitrogen boost that will quick start the decomposition process. The flowers are highly attractive to bees and other beneficial insect pollinators. Red clover can be used for stock fodder, although it may cause bloating if fed in excess. Red clover can be planted under fruit trees where it will compete with weeds, protect soil health as a living mulch and feed the soil when each clover plants dies and decomposes. Red clover grows best in full sun or light shade. Red clover is tolerant of frosts and will grow well on poor soils providing they are free-draining. Red clover requires supplementary watering to grow best, especially when young. Red clover will grow slowly over Winter but rapidly during warmer parts of the year. Red clover will self-sow in optimal conditions. Red clover may struggle to grow if soil pH is too alkaline. In cold and mountainous regions of Australia sow red clover seeds from mid to late Spring. In temperate regions of Australia sow red clover seeds during Spring. In subtropical regions of Australia sow red clover seeds from early Autumn to early Spring. In tropical regions of Australia sow red clover seeds during the dry season from mid Autumn to mid Winter. Ideally red clover seeds should be sown about 8mm deep, with 10cm spacing between plants. Red clover can be surface sown onto garden beds that have been raked to a fine tilth. Rake again after sowing to cover the seeds. Water seeds in well or germination will be slow and erratic. Red clover seeds germinate quickly, with seedlings emerging 7 to 14 days after sowing. Red clover will reach maturity and start flowering 10 to 12 weeks after sowing in optimal growing conditions.